Lets consider the hidden power behind the Presidents in the 19th Century and in this 21st century. Does this sound familiar when evaluating Barack Obamas current reign as President from January 20th, 2009 until January 20th, 2013. Not much has changed! 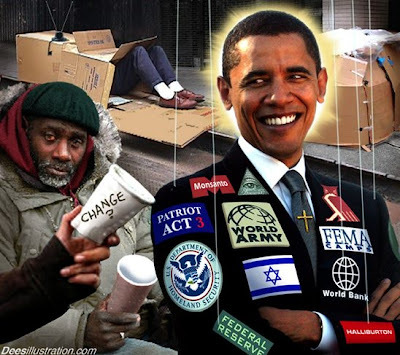 I daresay that the greedy, usury bankers of this 21st Century who run our modern, orthodox, economic system of usury-based, debt money selected Barack Obama and have been telling him what to do. When Lincoln played by the rules set down by the usury bankers, he relished his stay at the seat of power. However, when Abraham Lincoln broke the rules established by the hidden power of the usury bankers he paid the highest price  his life. On page 162 of War Cycles, Peace Cycles Richard Kelly Hoskins writes: "During the war between the States Lincoln came in conflict with the banking interests who had put him in office. Lincoln wanted to raise money quickly for military expenses. The agreement between the banks and government was to have government borrow from them. This was all right with Mr. Lincoln, except the banks were not content with the usual interest (usury); they wanted extremely high interest (usury) rates since there was a war. This posed a problem. Lincoln didnt want to pursue an unpopular war or have to explain to voters why he was paying exhorbitant interest 9usury) to the banks." The banks had elected him and felt they owned him, and they simply refused to modify their demands. Lincoln, in a rush to get things done, did one of two things that may have cost him his life. He instructed his government to print and issue greenback tallies to pay for wartime purchases. These greenbacks did not go through the banking system. They were printed and issued directly by the government. They were interest free (usuryfree) paper tallies. The operators of the usury system were furious. They felt betrayed. European newspapers carried news items about this revolutionary development. Millions of greenbacks were printed by the government and spent into existence, and not a dime in interest (usury) was paid to the banks. So far, President Barack Obama has not broken the rules of the usury bankers who own him. Since President John F. Kennedy was assassinated in 1963, every President has complied with the rules of the usury bankers. Should we expect this pattern to change with the election of the next President in November 2012? In 1996, David Icke published a book titled I Am Me, I Am Free wherein he typed a few noteworthy and prophetic quotes about politics, money and finance that are worthy of repeating. "The party political system, like the financial system, is going to collapse because its structure is a physical expression of the old global energy field, the old imagination that humanity had of itself. To support this system any longer by voting in rigged elections (also known as democracy) is to give it an energy which will prolong its death and the human prison it underpins. It is wasting energy which could be used to create another reality to replace the old. Let it die, its day is gone. We are growing up now. As the spiritual transformation gathers pace and the sense of human reality changes, the old structures of party politics and interest-bearing debt are being thought out of existence. This will manifest on the physical level as people losing confidence in the system, refusing to play by its rules and the edifice of control will be denied the power (our power) which it needs to survive."